At first glance, it seems the only difference between resorts is the theming. While that is certainly the case, each resort has several other unique features that set it apart from the other resorts. These things don’t necessarily make one resort better than another, but they are good things to consider when you’re trying to decide where to stay. I’ve assembled a list of unique features for each resort and today I’m sharing, in no particular order, my top 10 reasons to stay at Disney’s Beach Club Villas. The Beach Club theming was influenced by the charming seaside cottages found in New England at the start of the 20th century. It has a casual elegance that feels posh without being stuffy. 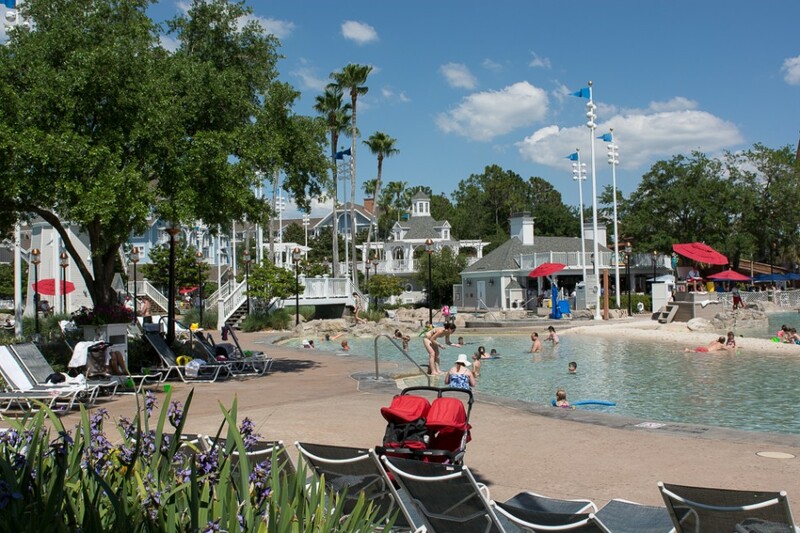 Without a doubt, Stormalong Bay is the best resort pool on Disney property. It’s huge, nearly 3 acres in size. It has a shallow, sand-bottom area for young children and lounging dads, a lazy river, a whirlpool current, and a giant slide disguised as a shipwreck. The deepest point is about 8 feet deep, deeper than any other Walt Disney World pool. Only guests at the Yacht and Beach Club Resorts are allowed to use this pool. 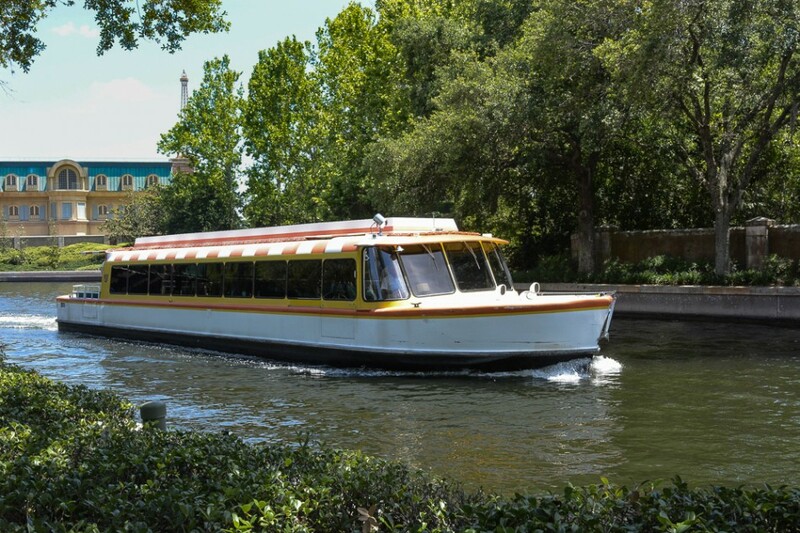 Friendship boats transport guests between Epcot, Hollywood Studios, Boardwalk, Yacht and Beach Club, and the Swan and Dolphin Resorts. I would much rather take a leisurely boat ride than hop on a bus any day. The boats arrive about every 20 minutes. 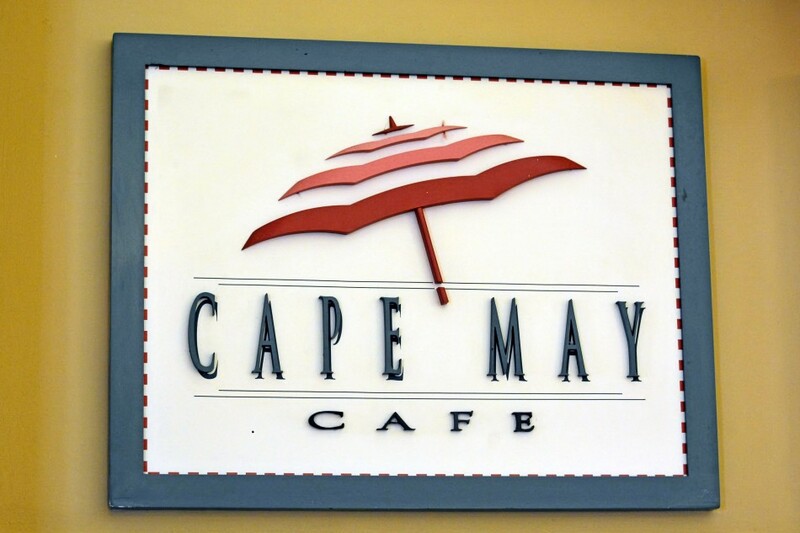 Cape May Café is an all you can eat buffet located in the Beach Club Resort. Donning their beach attire, Goofy, Minnie Mouse and Donald Duck greet guests at their breakfast beach party. The menu includes a variety of breakfast favorites including Mickey Waffles, breakfast pizza, biscuits and gravy, a fresh fruit and yogurt bar, fresh-baked pastries, as well as other yummy breakfast items. 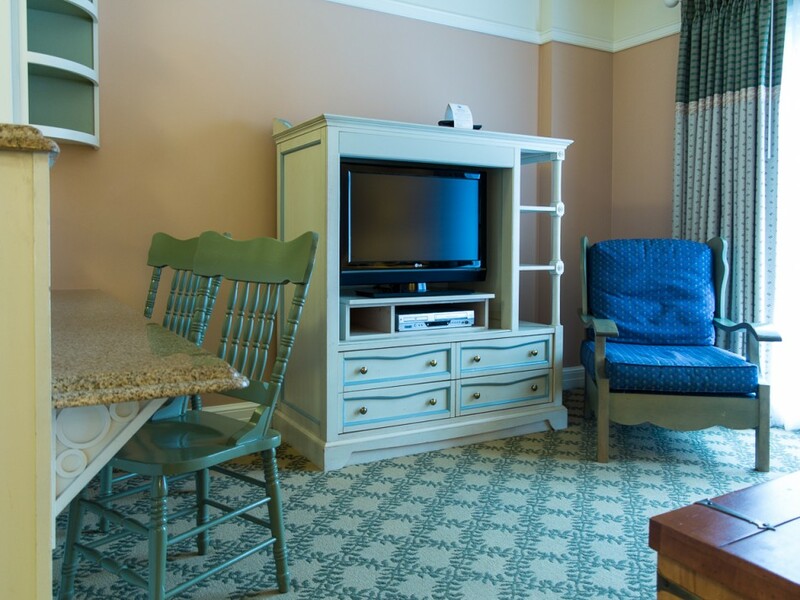 What could be better than having Beaches and Cream Soda Shop within walking distance of your room? 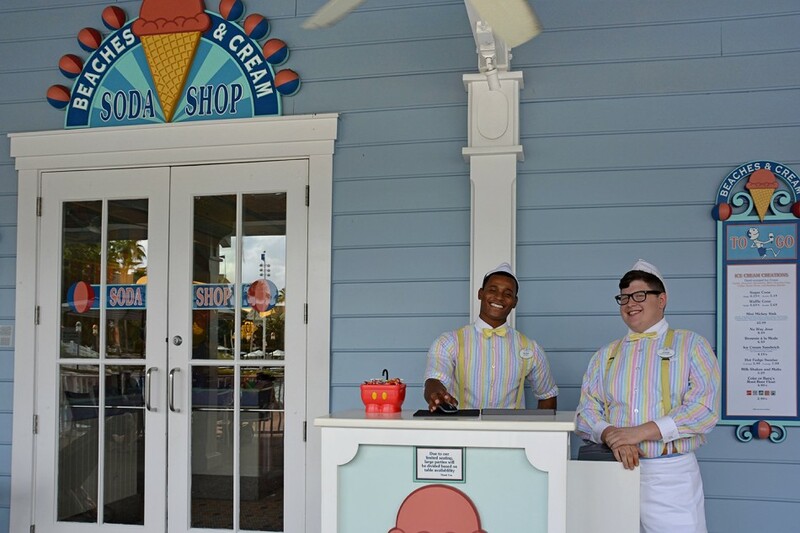 Just think, every day you can sample a different delicious ice cream treat – it’s vacation after all! For those of you who haven’t tried this old fashioned soda-fountain, trust me, it’ll be hard to pass by it without stopping in when you are staying at the Beach Club Villas. In addition to ice cream, they have one of the best burgers you’ll find in all of Walt Disney World. 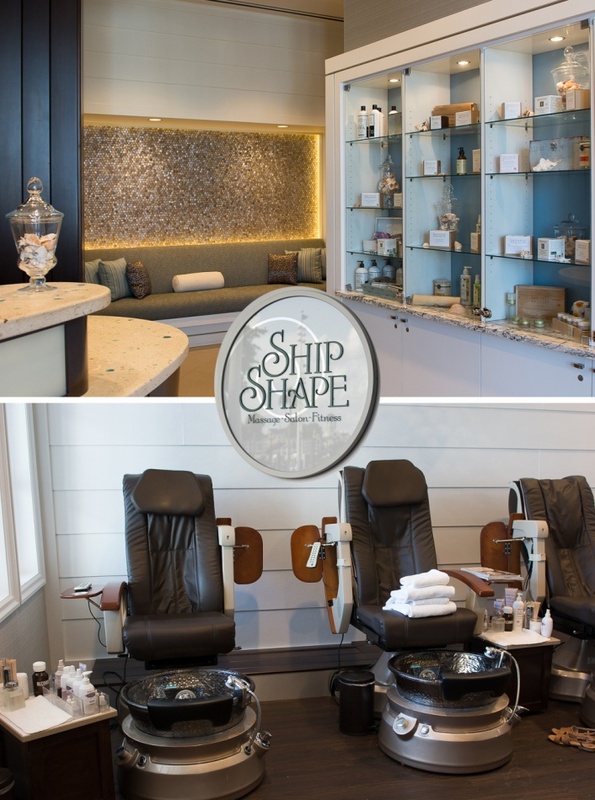 A real hidden gem at the Beach Club is Ship Shape Massage Salon Fitness. It’s easy to miss this little mini next door to Beaches and Cream. Isn’t that handy? After filling up on ice cream, you can go right next door and work it off at the fitness center! Personally, I prefer to start at the spa with a massage and then go eat my ice cream. The salon offers haircuts and styling, manicures and pedicures. 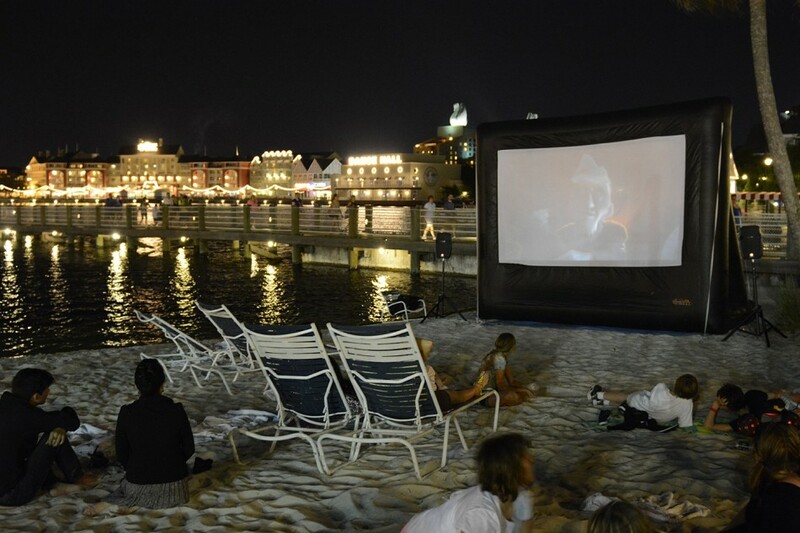 Of all the movie spots at Walt Disney World, this beach is the best by far. What fun it is to play in the sand while watching a movie. And just look at the view! What a relaxing way to end the day. Walking to Epcot from the Beach Club takes only 5-10 minutes. It’s closer from the resort to the gate than any other resort is to any park. 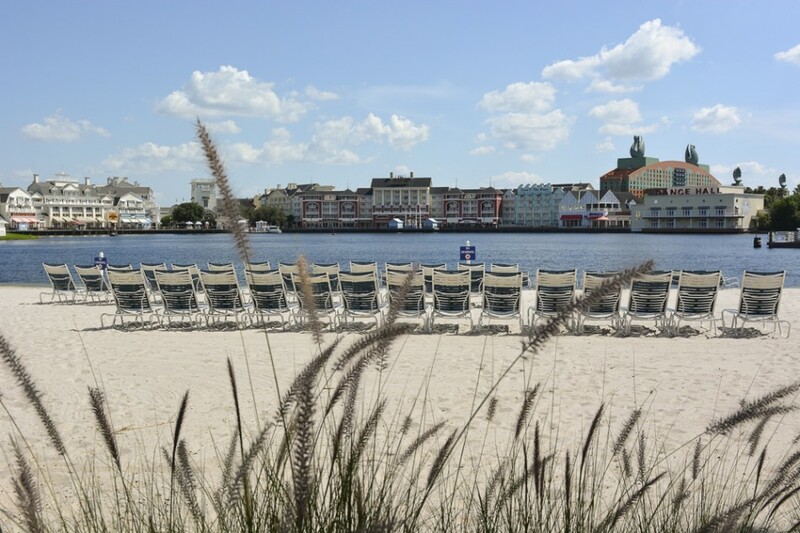 If Epcot is your favorite park, especially if you love World Showcase, you can’t beat the location of Beach Club for convenience. Here’s a tip: Notice how the sign above directs guests to go up that little hill to get to Beach Club. 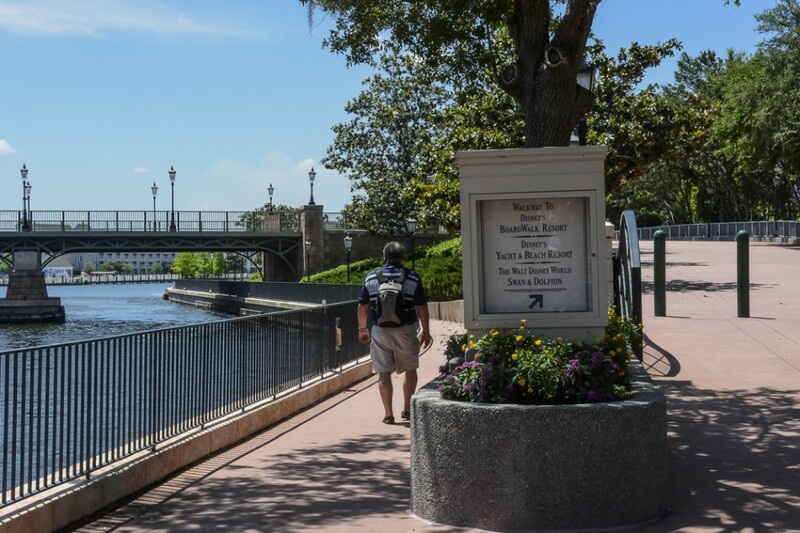 You do have to go that way if you are going to the Boardwalk, but Beach Club guests can take the low road and go under the bridge for an easier and quicker walk. Just follow the gentleman in the photo. 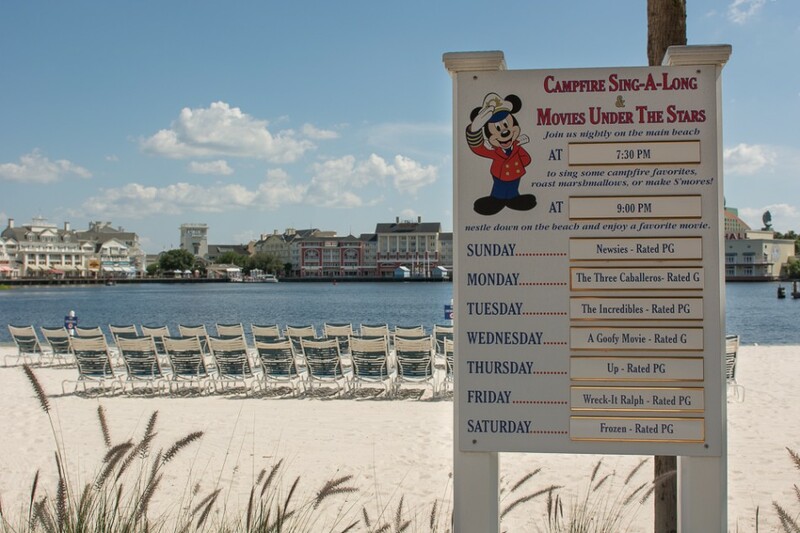 Speaking of Boardwalk… when you stay at the Beach Club Villas, you can also enjoy the Boardwalk. 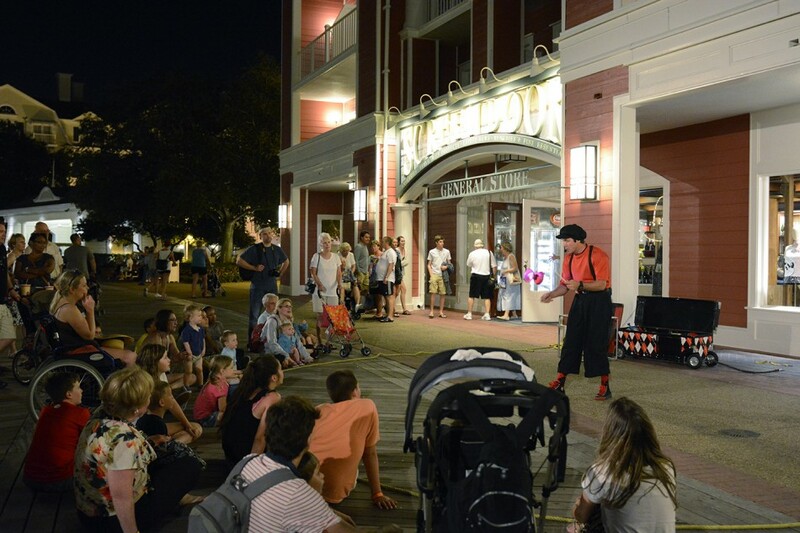 There’s nightly entertainment, games, snacks, surreys to rent, and all kinds of fun just a short stroll around the lake. Or, just enjoy the view from the Beach Club side of the lake. Within easy walking distance or a short boat ride of the Beach Club Villas are dozens of great eateries at the different Epcot resorts around Crescent Lake. 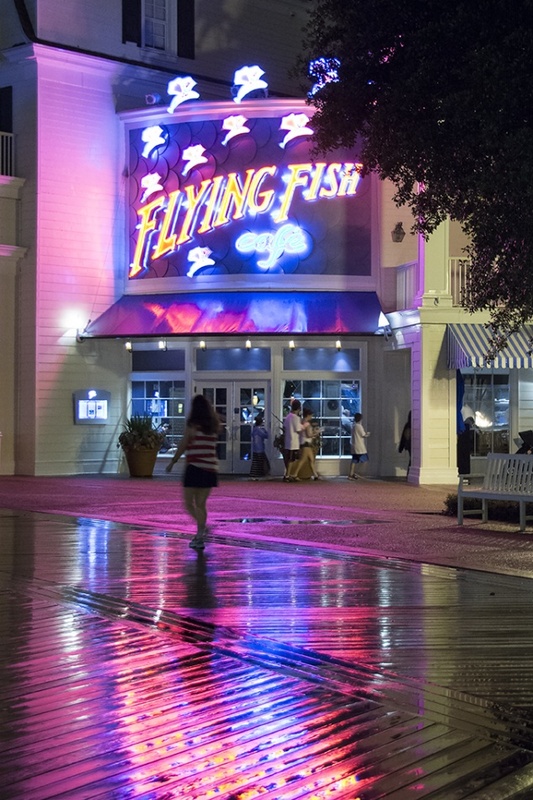 There are several fine dining establishments like Flying Fish Café, Il Mulino, and Yachtsman Steak House. ESPN, Big River Grille and Crew’s Cup offer more casual dining. Fresh Mediterranean Market has a wonderful breakfast buffet. And for the ultimate snack foods, grab a slice of pizza or a funnel cake on the Boardwalk. For foodies, this resort is the best! Honorable Mention: Really Big Arcade! This didn’t make it to my top ten list of reasons to choose Beach Club Villas over another resort, but I thought it was worthy of an honorable mention. The arcade at this resort is huge! There’s even more to it than what shows up in the photo. 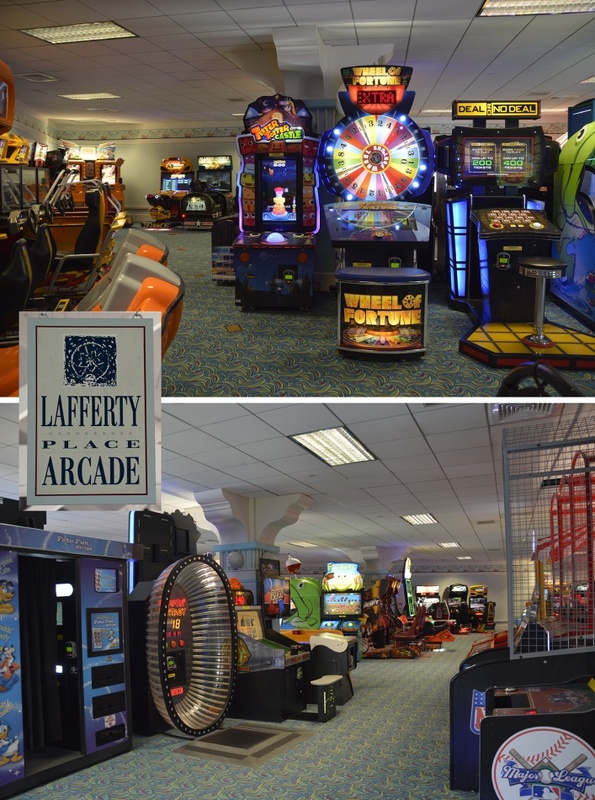 If your kids like games, just imagine how much fun they could have in here. 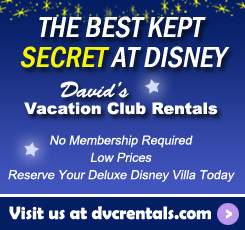 So, there you have it, my top 10 reasons for choosing Disney’s Beach Club Villas. If these things appeal to you, then Beach Club would make a great resort for your next vacation. Check out the other articles in our Top 10 series below. 47 thoughts on "Top 10 Reasons to Stay at Beach Club Villas"
The next time we stay on property, we want to stay here! Our two favorite parks are within walking distance! It doesn’t get much better than that!!! Love love love everything about The Beach Club. Best pool on any property and restaurants are phenomenal. If I could live here, I would!! We are staying 2 nights in January then 5 nights @ PVR and then 4 at the Bwv. Is that because there wasn’t enough points for you to have the whole time there or you wanted to mix it up? We have more than enough points but dh, ds wanted to try the Poly. We have Home resort of BW, AKV and SSR. There were only nights available at the beginning of our trip @ BC in a studio or 1 BDRM when we decided to book. We have also booked 10 nights at the beginning of May @ AKV Kilamanjaro club level. We will probably have 170 BWV pts and 150 SSR pts to rent. We have 4 contracts and had 2015 banked points. Because of this. Oreo Bon bons! Are they still doing movies on the Beach? Erin Crocker it’s all year round. Our longest Disney stay, 16 days for 25th anniversary, was here. Loved it. If things go right I will be looking for another stay. Wow that sounds amazing! Good for you! The best thing about the Beach Club villas is that they’re right next door to the Boardwalk villas. Nope- missed nothing! Totally agree! 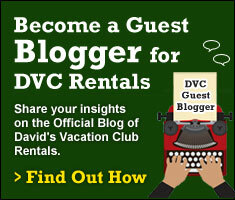 We own a DVC membership there and LOVE it. So many awesome things about that resort. So far it’s been my favorite. Just stayed there 2 weeks ago. Loved it! There were bus issues while we were there so it was great to not have to worry about transport to EPCOT – just walk out our back door! Plus can always take the bus to Boardwalk too if need be & walk over! Beautiful resort! My family was lucky enough to trade into BCV with RCI last January. It was amazing! Yay! We will be staying there in December!! Oh and listening to the British Revolution playing in World Showcase from my balcony. We will be there Nov 11th! It’s one of my favorites! We stayed there in August! We rented points from David’s and stayed there for my kids mid-winter break. We loved it! What a great resort! The gifts shops at both the Beach Club and the Yacht Club as well as the choices at the Boardwalk. Plus we can walk to the Swan and Dolphin and also fantasia Golf. Our original and bigger contract is at BCV. We’ve never stayed there. My favorite place to stay! If they had three bedroom villas we would never stay anywhere else.